with Tara Murphy & LIVE DRUMMING! Drum & Dance/Dance Spree is a free dance boogie with live drumming. All movement at Dance Spree is freeform, unregulated, and without instruction. * Please register in advance, as we will need a minimum number of students to run the class!! With LIVE drumming! OPEN LEVEL/BEGINNERS WELCOME. This dance will get your blood pumping and your heart soaring....feel the rhythms and shake what you got! Participants will learn the basic style of African dance as well as traditional dances from Mali, Guinea and Senegal, West Africa. The class emphasizes community, self-expression and the joy of movement. We will get down and let our spirits fly! Wear comfortable movement clothes; women often wear sarongs. Please bring water. 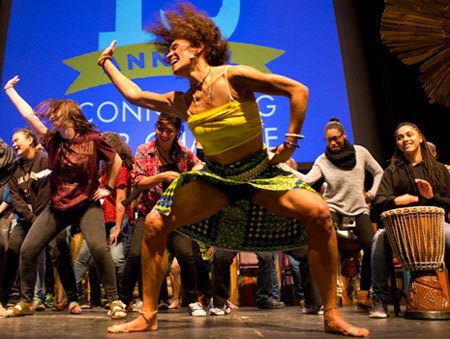 Led by Tara Murphy and the drummers of Cape Cod African Dance and Drum. Tara Murphy, originally from Washington, D.C., grew up studying ballet and theater. She earned her B.A. in theater and religious studies at Yale University. At this time she also began studying African dance and drumming, and exploring her African heritage. While at Yale, Tara was awarded a fellowship to study traditional dance and drumming at the University of Legon in Ghana, West Africa. For the past 20 years, she has studied closely under many African and Afro-Caribbean artists in Washington, D.C., New York City and Boston. Tara recognizes the practice of African dance and drumming as a tremendous force for healing, meditation, empowerment and community. It is her greatest honor to share the inspiration of these ancient traditions. Ult Mundane has been studying traditional West African drumming for over 15 years. He has learned from world-renowned teachers such as Famoudou Konate and Mamady Keita, and since 2010 he has studied with Namory Keita, a master drummer from Guinea who now lives in Maine. Try this exciting, beginning course on African dance and drumming from Mali and Guinea, West Africa. In a supportive group setting, we will learn traditional West African dances and rhythms, as well as explore the history and culture of this region. Students will drum, dance, read an ethnographic text, participate in discussion and create a short performance piece with a small group. This is a wellness setting, where participants can release stress while creating community and learning about Africa.